By default, all of our popups are set to size responsively within the browser. Popup sizes use percentage-based widths when displayed. Popup widths can also be set to use a non-responsive width in units of pixels ( px ), em, or rem.. When using custom dimensions for your popups, select either percentage widths or non-responsive width units (px, em, or rem). 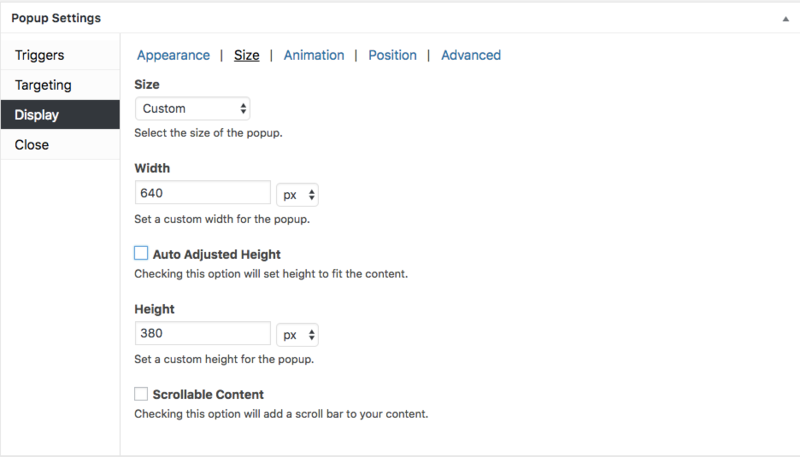 Several additional options are available to customize the width and height of your popup. To display a popup only on a mobile or tablet device ( and prevent it's display on a desktop screen ) requires the installation of the Advanced Targeting Conditions plugin extension to Popup Maker . The Advanced Targeting Conditions plugin extension also allows one to create popups targeted specifically for mobile-sized devices. The following slide out menu guide is a great example that uses Advanced Targeting Conditions. A popup menu can look great on a desktop screen, while it appears cramped and undersized on a mobile device as shown below. Advanced Targeting Conditions provides the ability to resize and display a popup effectively on both a small and a large-sized screen.